Mandy Walker is one of Australia’s leading cinematographers. 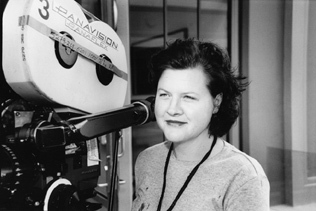 She shot her first feature Return Home (Ray Argall) in 1989 and her subsequent list of feature film credits include Love Serenade (Shirley Barrett, 1996), The Well (Samantha Lang, 1997), Walk the Talk (Shirley Barrett, 2000), Lantana (Ray Lawrence, 2001) and most recently Australian Rules (Paul Goldman, 2002). The AFI-nominated cinematographer talks to Rose Capp about the long hours and many satisfactions of working behind the camera in her increasingly high profile career. Rose Capp: You have said in an earlier interview that “from the time I left high school I knew I wanted to work with cinema cameras”. How did this interest develop and how and where did you get your start in the film industry? Mandy Walker: I had always loved going to the movies; I find it is like entering a dream, being in that dark cinema and watching a story told in images on the big screen. I started in the film industry when I was 18. John Flaus, who was teaching a cinema studies short course I was enrolled in, gave me a few contacts. I rang many times until one of them gave me a job as a runner on a feature film. Then I pestered people in the camera department and worked for nothing on a few documentaries and music videos. Then, as a clapper loader on some features followed by a focus puller. I was shooting student films and small docos and music videos with people such as Ray Argall at the same time. Then, I shot my first feature film when I was 25, Return Home (Ray Argall, 1989). RC: There were apparently very few women working in the camera department when you first started. What were your early experiences like as a female cinematographer working in a traditionally male-dominated area? MW: I never knew until I started working in the industry that there weren’t many women in the camera department, and I couldn’t see why. Basically, I have never taken it on as an issue, and I think that people will hire me because I am good at my job, not whether I am male or female. RC: In reviews of films you have worked on, your cinematography is regularly singled out as a distinctive element, but the look of the films varies widely, from the pastel colours of the Gold Coast setting in Shirley Barrett’s Walk the Talk to the cool, blue tones of Samantha Lang’s psychological thriller The Well. How much input do you have personally, when determining the overall look of the film, and is this very much dependent on the director you are working with? MW: I will spend a lot of time in pre-production with the director finding out how they see the story in visual terms, including the atmosphere and emotion each scene is trying to convey. Then, with the production designer, we will all look at references of different types, such as, films, photos, paintings and the locations themselves, to create a look that is right for that film. Some directors know before you start that process, exactly how they see it; for others, it is a process of finding out what the particular look is for that film. RC: The landscape, whether urban/suburban or rural, seems to be a strong element in your cinematography and you seem to have a particular affinity with the sort of decaying, small town milieus featured in Love Serenade and Australian Rules. Are you consciously attracted to projects in which the landscape figures as a central element? MW: No, I am attracted to a project if I like the script and the director. RC: Ray Lawrence’s Lantana (2001) offered a different sort of challenge, given the film was predominantly shot in natural light. Can you describe your approach in working on that film? MW: It was a fantastic experience, and a big challenge. To shoot a film with natural light is harder than lighting because you have less control. Ray Lawrence has a very particular style and way of making a film that is based on natural performances and the environment that you are working in. The actors, he wants to feel, can be in a room for example that is the least bit cluttered with equipment, and each location is chosen for the atmosphere that already exists there. Location surveys therefore are very important, and if they don’t work for light they are rejected. He didn’t want the film to look grainy, gritty and ‘low rent’, so my job was to never have the negative too under or over exposed either. RC: How do you think the new advances in digital technology will have an impact on feature filmmaking? MW: I work with digital post all the time now in commercials and find it fascinating. I think digital cameras and projection have a long way to go to be as good as 35mm film. At the moment they serve to make it cheaper for someone to make a film that they otherwise couldn’t afford, but the quality I don’t think is comparable. One day it will be, and then I’ll use it. RC: You’ve said that the main influences on your work have been European cinematographers. Who in particular do you admire and what are some favourite films? MW: My favourite DP’s have been Robby Müller, Darius Khonji, Darius Wolsky and Stuart Dryburgh. My favourite films range from Apocalypse Now (Francis Ford Coppola, 1979), The Shining (Stanley Kubrick, 1980), My Life as a Dog (Lasse Hallström, 1985), Cinema Paradiso (Guiseppe Tornatore, 1988), The Piano (Jane Campion, 1993), The Women (George Cukor, 1939) and Amelie (Jean-Pierre Jeunet, 2001). RC: Of all the films you have shot, which do you think represents your best work? MW: I think they are all different, but I suppose it would be Lantana because it was my biggest challenge. RC: You have worked on shorts, docos, non-features and features. Is there any genre/form that has particular appeal and how do you choose what projects to work on, i.e., what attracts you to a script? MW: I only shoot features and commercials now. I read a lot of scripts and will only shoot feature films if I enjoy the story and like the director, or find them interesting. RC: You have worked with directors Ray Argall (Return Home, Eight Ball) and Shirley Barrett (Love Serenade, Walk the Talk) and producer Jan Chapman on a number of projects (Naked, Walk the Talk, Love Serenade and Lantana). Is that sort of continuity with producers/directors important? MW: It makes it easier to be on a project with someone you have already worked with, but I also enjoy being with new people too, because you are always learning new approaches to filmmaking, and creative collaboration. RC: You have a young daughter, has it been difficult juggling the demands of a career in the film industry and motherhood? MW: My husband and daughter travel with me if I am away for a period of time, and otherwise he looks after her, and runs our business. I work pretty much every week, and long hours. I think the hardest thing is that all my spare time I try and spend with them so being able to have time on your own is rare. RC: Australian cinematographers have an increasing international profile, with the likes of Dean Semler, John Seale and Andrew Lesnie carving out careers in Hollywood these days. Do you think Australian cinematographers have a particular approach, aesthetic or way of working that distinguishes them in an international context? MW: I think we are generally easy going and get along with people. We are also hard workers and have been trained on lower budgets generally, so you tend to know how to work fast. RC: You recently completed work on your first American feature, Shattered Glass (Billy Ray), for Tom Cruise’s production company. Can you tell us about that shoot? Other than the scale of the production, were there noticeable differences between working conditions in Australia and the US? MW: It was different because it was a much bigger budget than I have had on a movie so far. The crews work slightly differently and the pressure is more intense, mainly because there were five producers to answer to, instead of one. RC: Are there many American female cinematographers working on feature films in the US? MW: There are a handful, but hardly any on big studio films. RC: What are you working on next? MW: Besides commercials, I am shooting Gillian Armstrong’s next film in Australia next year. RC: What would be your advice to women considering a career in cinematography? MW: Don’t make it an issue that you are a girl. Work your arse off and believe in yourself; be persistent without being a wanker!